Even if you’ve never engaged in mindfulness exercises before, Hall provides a wealth of practices and activities to help you get started. The very first part explains the difference between “doing mode”, which is what most of us are accustomed to, and “being mode”, which shifts the focus from “do things, make things happen, go!” to “simply be a part of what’s going on, and sit with what’s there in the moment.” From there the book builds on concepts like intention and acceptance, and being able to let go of unhealthy desires, giving readers a good foundation in mindfulness itself. Nature is an ongoing theme throughout the book, but it isn’t until Chapter 7 that we really start getting into more nature-specific practices. A lot of these are guided meditations that use imagery from generalized Native American and Celtic spiritual practices, but look for opportunities for animal-assisted therapy and creative acts like making a mask to represent your true self. 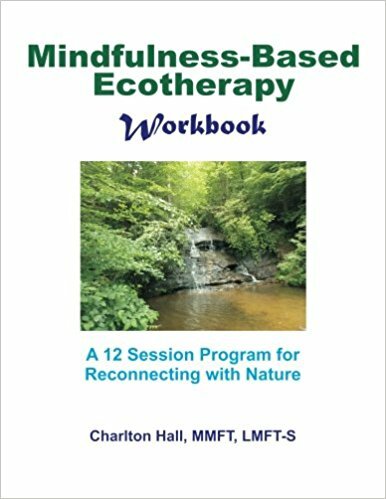 While the book is divided up into twelve “sessions” for purposes of an ongoing program in Mindfulness-Based Ecotherapy, there’s a lot more material than what can be covered in a single one-hour therapy session. This isn’t at all a complaint; rather, it is an opportunity for an individual, with or without their ecotherapist, to explore themselves in depth with a wealth of practices to aid them in their journey. Each person will likely gravitate more toward some of the exercises than others, which means that there may be something for everyone. If you are an ecotherapist using this with clients, you may find that the sorts of activities they gravitate toward the most may be helpful in your ongoing work together. And I think that’s one of the greatest values of this book: while it is necessarily linear to a point, you don’t absolutely have to finish one activity before you move on to the next. It’s helpful to at least familiarize yourself with each one, but if you or a client get stuck on a particular part, move to the next meditation or practice and see if it’s a better fit. This is a valuable tool of practical material for any ecotherapist.